“Garden of Stinging Nettles with Lilies and Space-sound”. which took place at the castle Ippenburg (GER) between May and September 2005. As in many years before, Germany’s biggest garden festival took place on Castle Ippenburg in 2005. It is here, at a place where, year by year, „garden“ and „nature“ itself enter into a dialogue with art, that a very special installation was realized which enabled a mutually enhancing symbiosis between architectural landscape design on the one hand, acoustic design on the other hand. It was integrated in the exhibition of 36 garden displays on the castle grounds, open to the public from May 26th to 29th as well as from June 5th to September 18th, 2005. 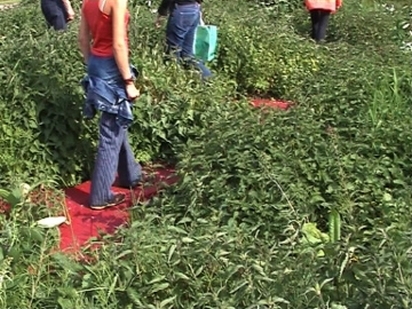 The visitor is invited to stroll through a wild field of stinging nettles, following a number of criss-crossing footpaths built of red-lacquered wooden slates. 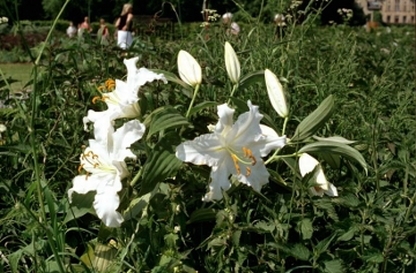 Only isolated white lilies stretch out their wide-open blossoms as if calling for help. Grown to hip height, the stinging nettles tower over the paths; just by looking at them, the visitor feels their sting on his/her legs. Frog- or fly-like monsters seem to be lurking behind the scrubs, insects, and maybe whole swarms of them who threaten to rise at the first touch of the leaves. A little further down the path, there is a slight humming noise, displaced at the next corner by loud chirping, creaking, cooing etc. sounds attracting the visitor’s full attention. We become fully alert to these sounds while crossing this display of a wilderness which is even enhanced by its acoustic features. There’s a light uric smell in the air, typical for the stinging nettle: this is a waste place even in this sense, although the lilies’ fragrance seems to drown out everything else. We get the impression that we have never visited such a squalid place before, fouled by unrestrained growth of weeds, covering the remains of culture and attracting myriads of vermin of all kind. The armada of resilient natural forces returns, reclaiming what has always been theirs – and this happens, above all places, in our Western region – for what rages here are not exotic species, but the marginalised living forms of our own civilization: weeds and bluebottle flies, so to say, species we have tried, and are still trying by applying a wide range of destructive strategies – to expunge successively in our bourgeois society. The scenario, an a-topia in the widestsense, in which nature has reclaimed cultivated space, is part of a wide-spread exhibition strategy firmly rooted in history: the integration of art into the context of a designed landscape. The installation entitled „Stinging Nettles and Lilies with Space-sound“ by the artists Sabine Schäfer and Joachim Krebs, which integrates their Space-sound installation „TopoSonic Spheres“, is part of the project by the landscape architects KLAHN + SINGER + PARTNER, from Karlsruhe. In recent years, the two artists signing under the logo <sabine schäfer // joachim krebs> have become known for their compository work with animal sounds. In „TopoSonic Spheres“, these animal sounds are arranged to form an orchestra of oscillating space-sound images of beetles and insects. For their garden installation, landscape designers distributed individual lily plants in flower-pots under a dense cover of stinging nettle plants. Complementary to the botanical scenery, eight loudspeakers emit the artist-couple’s 4-channel insect noise Space-sound composition with the movement of the sounds suggesting real movement of the insects. In this composition, landscape and space-sound deliver each other further impulses enhancing the multifariousness of the experience space/sound. The coarse topography of the stinging nettles render material tangibility to the sounds – vice-versa, the sound provokes a comprehensive awareness of the space, forcing the recipient to get immersed in the architectural construction. What meets the eye is surely not in the least „aesthetical“ in the traditional sense of the word; at first glance, it eludes our conditioned appraisal of aesthetics. The aesthetical aspect of this work, however, rests in its semantic level – and that, as we will later see, also on the acoustic level. First to mention, this manner of dealing with – reproduced – botanical elements, is related, in the field of the arts, to iconography – attention is called here to the subject of the stinging nettle and the lily as a „plant community“, with both plant specimens being considered „love plants“. Tradition holds that only a true virgin may touch a stinging nettle without being stung. The stinging nettle was considered a symbol for the painful stinging of love or for hopeless love. When prepared according to ancient recipes and eaten, it was said to be a libido-enhancing aphrodisiac. Thus it was recommended to boil nettle leaves in wine and drink the resulting potion, as it was supposed to „light the fire of love“ and induce unchaste behaviour in a person. The lily, on the other hand, was considered a sign for perfect love, which however did not consist in the physical reunion of two humans, but of man’s and God’s spiritual reunion, practically a symbiosis of the female and the male aspect, which made any other reunion and the errings of physical love redundant, for in this case, the two aspects may remain what they are. It doesn’t come as a surprise, therefore, that the lily is, at the same time, a symbol for unhappy marriage or even the death of a relationship. According to Paracelsus’ doctrine of signatures, nature by itself grows plant communities from which man may derive his „prescriptions“. Consequently, nature’s dictate will make a physician write down recipes that wouldn’t look harmonious on a prescription form, but will naturally grow in friendly communion. As landscape design integrates the lily and the stinging nettle into an artificial plant community here, thus playing the „creator’s role, they produce a concoction that proclaims the general and absolute victory of the compulsive pleasure principle over „civilized“ retainment, over renunciation and abnegation. In this sense, the artists deal with the subject of „pleasure“ on a symbolic level, exploring its social status in confrontation with the unrestrainedly alluring siren-like demon voices calling from the undergrowth. Again, nature’s forces, the compulsive trait of man, celebrate their triumph over the bourgeois society’s principle of „law and order“, while at the same time it is obvious that to surrender to them will not induce complete fulfilment, but rather a state of languishing and yearning in the vain effort to satisfy lust and libido. It is a scenario devised by the vanished bourgeoisie with all its ideals and obligations displayed by the new post-cultural balance. Still, the artificially created „reality“ is the result of merging processes – and the same is true for the realization of the acoustic Space-soundComposition. Animal sounds reach the ear when the visitor takes on a frog’s perspective; he/she is practically compelled to kneel down to be able to perceive the world. The spiritual prostration may be interpreted as a humble gesture before creation itself, but it is also as a sign of humility displayed before the indestructible and immortal primal forces or an expression of an extremely sharpened feeling of alertness in combination with vague fear. What you hear seems to be invented by nature, not copied of nature. There seem to be insects, but really, there are only composed sounds or insect voices. The visitor assumes that he hears acoustic chimeras coming from a world we prefer to banish from our „clean“ everyday life – or that we consider, in the respective natural ambience, as sounds of an unflawed natural environment. Now that dimensions are toppled over, we feel so close that we seem to look eye to eye with them, confronting monsters from a different world. 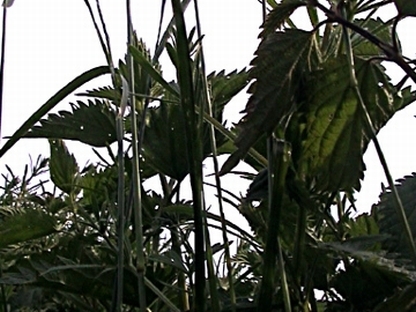 The stinging nettles’ architecture of proliferation is quasi repeated on the acoustical level. To this purpose, the sound artists resort to recordings of natural noises and sounds produced by the animals’ movements and activities. Later, these are magnified and disassembled into their acoustical parameters such as rhythm, frequency, dynamics, 3-dimensionality and timbre. Nature sounds, climatic conditions as well as the topographic environment play an important part in the process. The sampler recording the animal sounds and noises serves as an acoustic microscope used to explore the sounds in detail. The artist-couple calls this „EndoSonoScopy“, which means the reproduction of intrinsic sounds. Subsequently, individual fragment patterns are isolated and archivated/filed depending on the analysis’ result. The acoustic pattern particles resulting from this process all have one thing in common: they lend audibility to sound dimensions usually not perceivable to the human ear. Frequencies too high or too low for us, what is too slow or too fast for perception is transposed into the acoustically perceivable realms by magnification, reduction, acceleration or speed reduction. Architectonical parameters enable transference to the human scale. These magnifying tactics thus shift the sounds into a different perspective, where they are kept in abeyance. The inner life of individual sounds is practically uplifted from the microacoustic level to dimensions perceivable by man. These particles constitute the basic material of all Space-soundCompositions, all of them also being submitted to architectural arrangements in real space. In order to intensify these soundspecific patterns, so-called loops are produced in the course of the composition, which emphasize their intrinsic meaning. It is above all sound microscopy, relevant magnification of sound, which grants higher „objectivity“. Consequently, the sounds gradually leave the semantic level, changing into strongly imaginative impulses for subjective fantasies. The individual sound components influence each other continually, giving rise to iridescent sound structures creating, on the basis of the real sounds, images of even more fantastic living organisms in the visitor’s mind. In this context, the artist-couple likes to speak of „sound milieux“ settled between reality and a completely virtual reality. What make these of special interest are their constantly modified transitions. To transfer knowledge of nature’s constructions and procedures to the field of technology is actually an analoguous transfer of one of nature’s „special inventions“, not a copy of nature. In this context, even extreme magnification may be considered as a transfer to a different framework. In this sense, nature is the impulse, the stimulus for independent technological design – the result is a technical revelation of the construction, processing and developing principles determining biological systems. One of the first – and in terms of science history most famous – transfers dates back to Leoardo da Vinci. After having investigated the wingflapping of birds, he proposed to build – with the means of his period – flapping wings, thus entering the field of „technical biology“, which means biological basic research under physical aspects and the transferring of the results to technology. In our times, it is surely the American architect Richard Buckminster Fuller who by his transfer of optimized construction principles in nature to architectonic buildings drew most attention to his work. Three fields of transfer may be distinguished: nature’s construction („construction transfer“), nature’s strategies or procedures („strategy transfer“) and the principles of information, transfer, development and evolution („information transfer“). found innature. It is vital to find a way to get away from the pre-scientific step of the pure „copying“ of nature and integrate the – in fact endless – realm of „natural constructions“ into electroacoustic music. The artist-couple does this successfully by disassembling sound material and rendering its principles perceivable. By application of transfer, a respective change of perspective is possible allowing new insights into familiar sound images and familiarizing the listener with a new reception of music. The principle of alienation has been known as an aesthetical procedure since the times of Berthold Brecht. 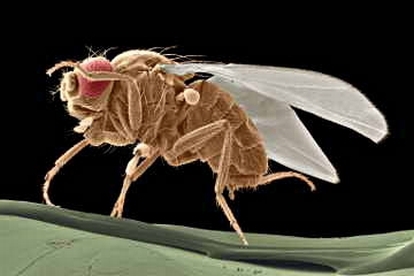 Today, owing to the latest technologies, it offers additional dimensions which are all the more complex, the more „microscopic“ the analysis and synthesis of the living world particles. While landscape architects are still, in collage-like fashion, mixing what a private gardener would never, nature, however, would always bring together – e.g. lily and stinging nettle –, nature’s sound experts set to work on a much more artificial level. From so-called „super signs“, they construct a new, hybrid sound world, a reality which is not simulation and not reality either, as it consists of hybrid sounds which the listener perceives just as micro-organisms of his imagination, which, however, he seems to know and to recognize. Something simulative is attached to these hybrids, that is, to the visitor they are neither one thing nor the other, neither true nor false; to him, the world assumes the character of „as-if“, which, though, is real by itself. These procedures are mixings on the level of the codes of the respective sign or text system on the basis of the formation of decontextualized „super signs“ with selfsimilar character. Magnification enables audibility of the pure sound processes, quasi a trip through the fractal sound structure and its endless structural similarities. The secret of what keeps the world together, its rhizomatic bends and links are revealed to any person who tends to listen accurately. universal sounds to be equally „understood“ everywhere in the world. Consequently, they are transverbal and transcultural at the same time. Possibly this is exactly what constitutes the strength of those hybrids by the artist-couple: they concentrate on the sound typologies and intensify their character through the process of extreme magnification. Quite appropriately, they describe their work as their subjective view of the expressive materia „nature“ they themselves have desubjectivized. It is an essential trait of the presentation form of their Space-soundCompositions, that the sounding source remains invisible and is left to the listener’s imagination. The recipient is left to his/her own devices, has to resort to his listening experience, his senses and his ability to attach meaning to the acoustic impulses. He takes part int he openness of world experience and is embedded in the process of destabilization of an acoustically enhanced dichotomy of contradictory sensual information on the stinging nettle and the lily – of nature and culture. Depending on the respective intensity of the sound and the visitor’s standpoint, either the sense of touch, the sense of view or the sense of listening will dominate and mingle with other sensual information. 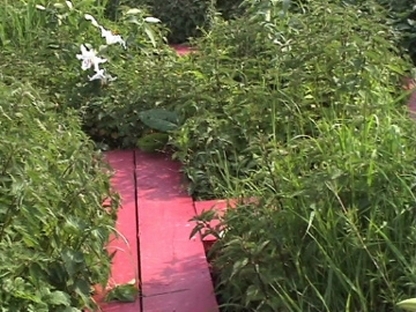 In fact, the nettle garden stimulates all senses and gives rise to hybrid space-sound worlds. Strolling through the garden of stinging nettles with lilies and space-sound, we get a first impression of what expects us once our cultural values will no longer be a cherished part of our lives. However, do we necessarily have to take this negative view? Is it really so unpleasant to find oneself surrounded by our natural forces, of which we ourselves are an integrative part? This work also reminds us of our origins, of primal times when acoustical „values“ were cherished parts of people’s lives, just as in the duo of artists’ Space-soundComposition. The stinging nettle constitutes a showpiece in this respect: Interpretation of its colour, shape, fragrance and taste is so variegated that you could fill a whole volume of a medical manual just writing down all the conclusions drawn from the plant’s outer aspect to assess its potentials. Accompanied by the sounding signatures of the living micro-organisms, we are invited not to let our ability of interpretation and assessing meanings to natural features wither, to recall our natural talent for reading signatures and become aware of our abilities. Man’s inner strength has always rested in his capacity to interpret and to create meaning. The „garden of stinging nettles“ as a garden exhibition shows us insistently that this capacity will prevail to this day over all modern „artificial breeds. The author, Dr. Annette Huennekens, is a freelance media art scientist. „Expanded Museum. Kulturelle Erinnerung und virtuelle Realitäten“, Bielefeld 2002.